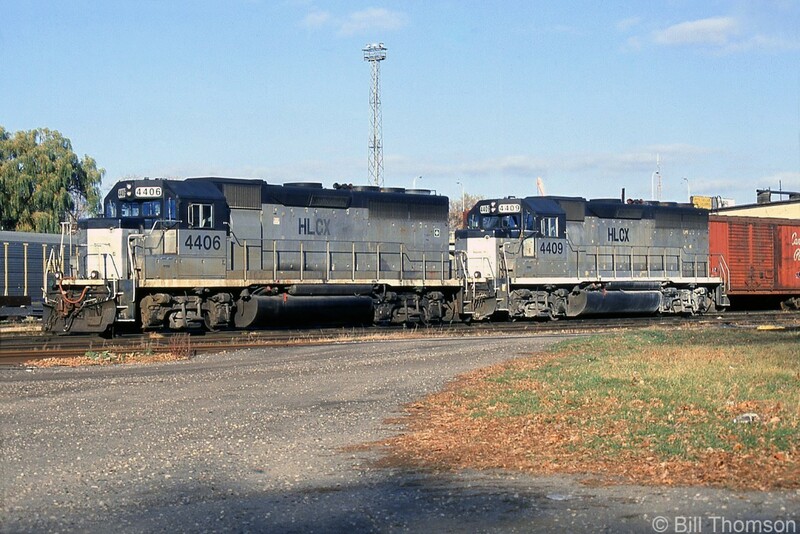 Railpictures.ca - Bill Thomson Photo: HLCX (Helm Leasing) GP40′s 4406 and 4409 sit at CP’s yard in London back in October 1998, both former Amtrak units in their former owner’s colours (originally built for NYC and PC, respectively). They were part of the large amount of leased units that power-short CP had on hand in the 1990′s. | Railpictures.ca – Canadian Railway Photography – photographie ferroviaire Canadienne. Caption: HLCX (Helm Leasing) GP40's 4406 and 4409 sit at CP's yard in London back in October 1998, both former Amtrak units in their former owner's colours (originally built for NYC and PC, respectively). They were part of the large amount of leased units that power-short CP had on hand in the 1990's.